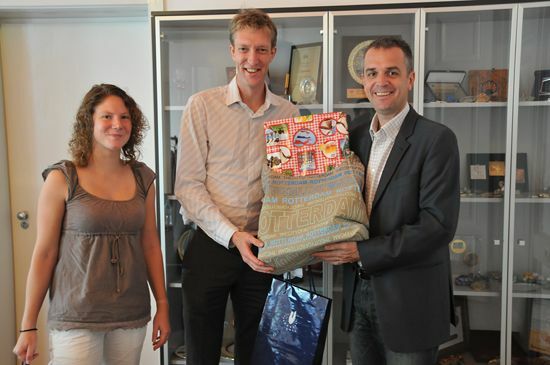 The representatives of the Rotterdam bidding committee for the 2nd European Universities Games 2014 visited the EUSA Office on Monday, October 3, 2011. 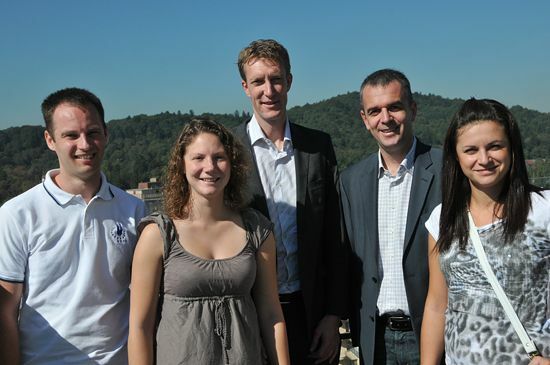 Miss Hester de Vries, International relations manager with the Dutch students sports association and Mr Menso de Maar, Director of the Erasmus Sport with the Erasmus University in Rotterdam came to Ljubljana to get more information for the EUSA evaluation visit and attribution process of the Games. They were welcomed by Mr Matjaz Pecovnik, Secretary General, and Mr Andrej Pisl, Communications Manager. EUSA President Mr Alberto Gualtieri also welcomed the delegates via short teleconference and wished everyone a successful meeting. EUSA representatives then presented the organisation and structure of EUSA, European Universities Championships and European Universities Games. Special presentation was also given to the volunteer programme and registration system. The Rotterdam delegation presented their plan for the evaluation visit and asked for additional information about the bidding and attribution process. At the end of the visit, some protocolary gifts were exchanged. Next week, EUSA Evaluation committee, composed of the President Mr Alberto Gualtieri, Secretary General Mr Matjaz Pecovnik and Executive Committee Member Mr Kemal Tamer will visit the bidding cities for the 2nd European Universities Games 2014 – Wroclaw (POL) and Rotterdam (NED). The Games will be attributed after the final presentation of both bids on November 26, 2011 at the EUSA EC Meeting in Codroba, Spain – the host city of the inaugural edition of the event.